NEW BRITAIN – Democratic candidate for governor Ned Lamont dropped by the city on Friday for one of his many stops across the state leading up to Tuesday’s primary. 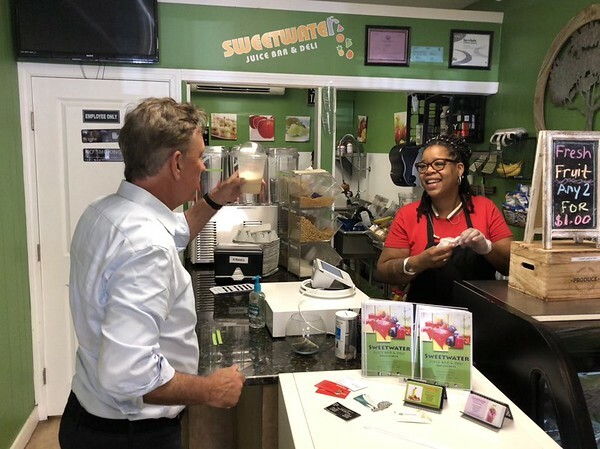 As he enjoyed a banana cream smoothie from Sweetwater Juice Bar & Deli, Lamont spoke about his stops earlier in the day. The candidate met with workers at Electric Boat in Groton before heading off to Middletown and Bristol. “Folks are very happy (at Electric Boat). They know they have a good job for the next ten years,” Lamont said, referring to the company’s recent multibillion dollar contract with the U.S. Navy. The Democratic Party-endorsed candidate said the energy surrounding his campaign has been high. Lamont said he thinks his “optimistic” view of Connecticut’s potential is connecting with voters, and he criticized his Republican counterparts for their campaign rhetoric. “How can you lead if you’re a pessimist?” the candidate asked. During a forum Thursday morning, Lamont’s Democratic rival, Joe Ganim, criticized Lamont for not attending. Ganim took out his phone and appeared to call the party’s endorsed candidate. Sitting in Sweetwater on Friday, Lamont recalled that he thinks Ganim did actually call him, but he was busy at another campaign stop. “Knowing Joe, he probably called me collect,” Lamont said with a smile. Posted in New Britain Herald, New Britain, State on Friday, 10 August 2018 19:13. Updated: Friday, 10 August 2018 19:15.